New Regency Coat and Hat! I am very excited about the new Regency 'going-out' set. It has a soft brushed corduroy coat, which looks like velveteen. My favorite part is the hat. I have spent quite a long time perfecting this design and I am thrilled with the results. The page with the full details is Here. Sneak Peek at new Regency designs! 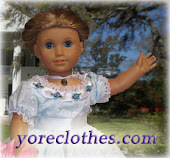 Even though there are no pictures yet, I though I would let eveyone know what is coming up in the next week or so for Doll Clothes of Yore! An absolutely gorgeous regency bedroom set! This includes a white chemise and a beautiful embroidered light blue dressing-gown. A lovely melon-colored day dress inspired by a costume in the latest movie version of 'Emma' starring Romola Garai. Soon I will make a long 'Spencer' coat. This will be made of dark blue brushed corduroy, which looks and feels like velveteen. 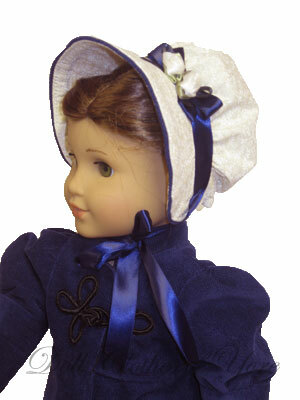 I hope to put a straw poke-bonnet with this dress. Pictures are forthcoming, and the product pages on the site should be set up in a week or so. For now, however, here is the link to the current Regency Gallery. A Popular Design is back! 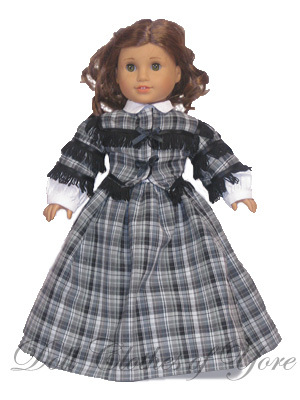 The limited edition 'Harriet Beecher Stowe' dress is a new version of an older design! The past versions have been extremely popular, and I hope that this one will be as well! 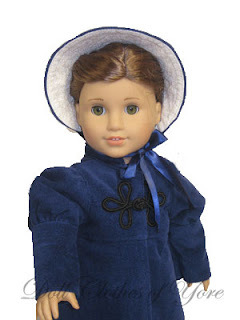 The dress is fashioned after a popular Civil War design that features wide Bolero sleeves. There are only four of these dresses available, so if you love this design as much as I do, don't wait! In looking for new medieval designs, I came across this old design from 2007. It was a unique pattern, so I decided to make it again. It's a limited addition and as of now there are only three available. Click here to go to the product page on our website. Enjoy!